An Alternative 4th of July Celebration Commemorating Frederick Douglass was truly a community-building event! 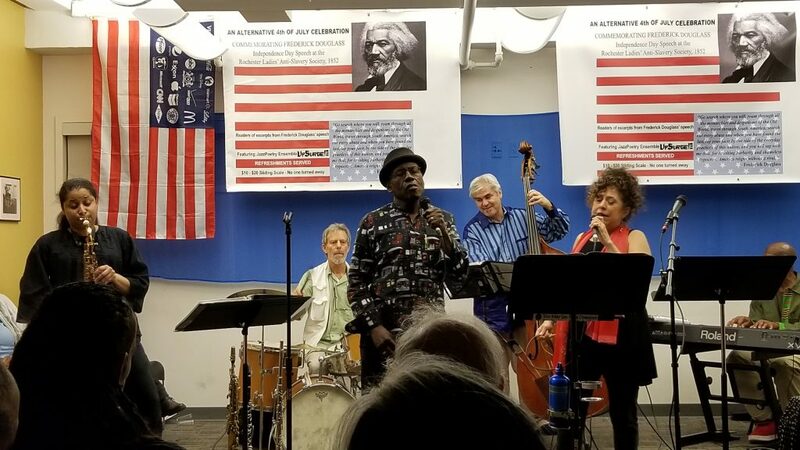 The event organized by Raymond Nat Turner (Co-Chair NY Chapter, NY Delegate) brought members of the music, literary and political communities together. NWU members Margaret Kimberly and Diane Ward were two of the four readers of Frederick Douglass’ historic 1852 speech, “What Is The Fourth of July To The Slave?” New member Sam Friedman was one of the three Solidarity Poets from Jewish and Palestinian communities. The featured performance was JazzPoetry ensemble, UpSurge! NYC which is comprised of the two poets Raymond Nat Turner & Zigi Lowenberg (NWU Trustee, NY Steering Committee) and their four instrumentalists on piano, bass, drums, and saxophone/flute. UpSurge! NYC presented a surprisingly fresh hybrid of theatre, Jazz concert and poetry reading. They also offered opportunities for audience participation. The audience was throughly engaged from the bassist’s first note to the poets’ last syllables…At evening’s end the audience appeared uplifted and more connected with one another. In addition to hosting the event at the National Writers Union, we were joined by other organizations in supporting this event, i.e. Poets & Writers, UAW CAP fund, and the Rosenberg Fund for Children. The National Writers Union is pleased to work more closely and directly with the work of these organizations in supporting our literary arts community. We look forward to working together in sponsoring more events of this kind in the future.